Using stone and wooden tools as anvils and hammers to open nuts is a cultural tradition among some chimpanzees. A series of YouTube videos of this behavior can be found here. Chimpanzees use hammers of stone or wood to crack various species of nuts on anvils of stone or root (McGrew 2004, 119-120). Soft-shelled nuts can be cracked with wood. Hard-shelled nuts can be cracked only with stone. The best stone hammers are carried from one worksite to another. Nut-cracking is a skilled activity, because the chimp must apply just the right force in the right way to crack the nuts open. Using tools for cracking nuts is one of the many behavioral traits that show a cultural diversity among chimpanzees that is comparable to the cultural diversity of humans (Boesch 2012, 219-225; McGrew 2004, 126-128). 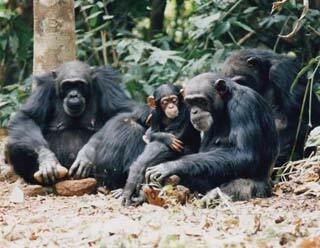 Comparing the wild chimpanzee communities across Africa shows that each community has its own distinctive repertoire of behavioral traditions that indicates the cultural history of each community. Hammer and anvil use is one example of variation in material culture. Nut-cracking is found only in west Africa, and not at all in central or east Africa. Most of the nut-cracking is found near the convergence of the borders of eastern Liberia, western Ivory Coast, and southeastern Guinea, which suggests that this cultural tradition was invented in this area and then diffused outward. Remarkably, the chimpanzees that have been studied for the longest time--those in Gombe and Mahale in east Africa--have never shown a single case of cracking nuts with tools, although the nuts are there, and although the local people use stones to crack nuts. As McGrew (2004, 126) has suggested this resembles the striking differences in cultural traditions often found among human beings, as in the contrast between the foraging Tasmanians and the aboriginal foragers of the Australian mainland. The Tasmanians did not have hafted stone tools, bone tools, nets, fish hooks, shields, spear throwers, boomerangs, canoes, or fire-making, although all of this was part of the culture of the Australian foragers. Some people have argued that the behavioral diversity among the chimpanzee communities in Africa could be a product of differences in the ecological environments or genetic differences between the communities. But a study of three neighboring communities of chimpanzees in the Tai National Park in the Ivory Coast showed cultural differences in nut-cracking that could not be explained by ecological or genetic differences (Luncz, Mundry, and Boesch 2012). These three groups live in the same forest environment. And since females frequently migrate out of their natal groups at maturity to join another group, great genetic differences between the communities are unlikely. All three communities use hammers to crack nuts, but they differ in their selection of hammer material and hammer size. During the nut season, the nuts are harder early in the season and softer later in the season. Harder nuts require stone hammers to open them. Softer nuts can be opened with wooden hammers, which are more plentiful. Two of the communities tended to switch from stone hammers to wooden hammers during the season. But one community tended to stay with stone hammers the entire season, which suggested a distinct cultural tradition of hammer selection. Human cultural traditions often have a long history, and human tool use can even be traced back into the prehistoric Stone Age. The same is true for the chimpanzee cultural tradition of tool-use in cracking nuts. In 1843, there was a report of chimpanzees in west Africa using tools to crack nuts, and this was cited by Darwin in The Descent of Man as evidence for cultural traditions of tool-use among apes (2004, 102-103). In the 16th and 17th centuries, some Portuguese people reported seeing this in Sierra Leone (Sept and Brooks 1994). This would suggest that this cultural tradition has been in west Africa for at least 400 years. Recently, scientists have reported archaeological evidence for chimpanzee sites for cracking nuts with tools that can be dated as at least 4,300 yeas old (Mercader 2007). The ancient tools at these sites show use-wear patterns and microscopic organic residues that identify them as chimpanzee tools rather than human tools. This shows how the methods of archaeology used to study the prehistoric human Stone Age can be used to study the prehistoric chimpanzee Stone Age, and from this has emerged a new discipline--"primate archaeology" (Haslam et al. 2009). The opponents of biopolitical science often argue that the study of primate behavior has no application to human behavior, because only human beings are cultural animals. Even many of the proponents of biopolitical studies--like John Hibbing and his colleagues--concede that while biology can illuminate the genetic bases of politics, biology has nothing to say about cultural history. This research on chimpanzee culture refutes this stance by showing that nonhuman animals do have culture and cultural traditions, and that these cultural traditions are historically contingent. The study of cultural history is thus as much a part of biology as is genetics. It is true, however, as I have indicated in various posts, that symbolic evolution is uniquely human, and therefore human culture shows a capacity for symbolic niche construction that chimpanzees and other animals do not have. I have written about the history of Lockean liberalism as symbolic niche construction. A biopolitical science would study political life at four levels: genetic evolution, behavioral cultural evolution, symbolic cultural evolution, and individual political judgment. Boesch, Christophe. 2012. Wild Cultures: A Comparison Between Chimpanzee and Human Cultures. Cambridge: Cambridge University Press. Darwin, Charles. 2004. The Descent of Man. 2nd edition. New York: Penguin Classics. Haslam, Michael, Adriana Hernandez-Aguilar, Victoria Ling, Susana Carvalho, Ignacio de la Torre, April DeStefano, Andrew Du, Bruce Hardy, Jack Harris, Linda Marchant, Tetsuro Matsuzawa, William McGrew, Julio Mercader, Rafael Mora, Michael Petraglia, Helene Roche, Elisabetta Visalberghi, and Rebecca Warren. 2009. "Primate Archaeology." Nature 460:339-344. Luncz, Lydia, Roger Mundry, and Christophe Boesch. 2012. "Evidence for Cultural Differnces Between Neighboring Chimpanzee Communities." Current Biology 22:922-926. McGrew, William. 2004. The Cultured Chimpanzee: Reflections on Cultural Primatology. Cambridge: Cambridge University Press. Mercader, Julio, Huw Barton, Jason Gillespie, Jack Harris, Steven Kuhn, Robert Tyler, and Christope Boesch. 2007. "4,300-Year-Old Chimpanzee Sites and the Origins of Percussive Stone Technology." Proceedings of the National Academy of Science 404:3043-3048. Sept, Jeanne M., and George E. Brooks. 1994. "Reports of Chimpanzee Natural History, Including Tool Use, in 16th- and 17th-Century Sierra Leone." International Journal of Primatology 15:867-878.